If you want to drop a few kilos fast, and if you are serious about losing body fat.... then we know this programme will work for you….. It’s like a fat melting programme! And the best part is it is completely natural. Belly Buster programme is a 10 day programme, you get one canister of our delicious Formula 1 Shake in your favourite flavour, and two special fibre products, one that absorbs & eliminates fats & toxins, and one that helps with digestion, cleansing & elimination. 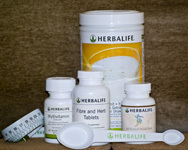 It gives you 114 Vital Nutrients in our Formula 1 Shake without the extra calories. It is seriously like having lipo-suction on the inside naturally, without the cost or pain! How It Works….. It’s so simple!!! Eat a normal main meal, whatever you normally eat- the programme will naturally help you cut back! Make sure you take the tablets BEFORE your main meal. Formula 1 Formulated Meal Replacement (560 gms)Formulated with an exclusive blend of selected proteins, vitamins, minerals and herbs. Low in calories, low in fat and a valuable source of fibre. Provides 18 amino acids to help the body function at its optimum level. Now contains Aminogen, a naturally derived ingredient that helps the body break down protein into free-form amino acids. Additional vitamins and minerals. Contains completely non-genetically modified ingredients. Enhanced fibre blend for a smoother, easier mixing shake. Multivitamin Complex with minerals and herbs is scientifically developed to provide nutritional support for individuals who may not obtain an adequate amount of essential nutrients from the daily diet. Fibrebond A high fibre complex consisting of Chitosan and Fenugreek, designed to assist with the maintenance of regularity as well as suppression of hunger. Also acts as an effective fat blocker, absorbing fat and passing it through the bowels, thereby not allowing it entry into your bloodstream. Florafibre Designed to protect the body against harmful bacteria, fungi, yeast and toxins. Assists in healthy bowel motions.